So, I just got a call from Bermuda Opinion Surveys confirming what others in the blogging spectrum have suggested with regards to push polling. Still on the two-fish bit, I woke up with more inspiration of what would be better and couldn’t help myself. Ok, so a friend has hit out in defence of the UBP’s fish bit as being a satirical poke but unfortunately most people don’t get satire. Now, I’ll be the first to admit that I’m one of the most unfunny guys out there, who is for the most part far too serious for my age, but I mean, come on. No offence to the UBP’s ad guys intended, but it could have been better and the problem isn’t the premise of two fish in the ocean nor the cartoons themselves. Largely, it’s the script, the non-Bermudian voices, the excruciatingly slow pace and the lack of overall content. The fish thing could still be made to work but I’m sorry if I just don’t get the point of the ‘opinion polls’ that involve tiny fish forming the letters UBP. It’s simply not funny because it just doesn’t make any sense. What do little fish forming the letters UBP have to do with polls? Here’s an example of how I would have made fun of ‘opinion polls’, and it’s something that could be captured in a still frame that takes all of a few seconds to get the gist of, which, in advertising, is about all the time you really have when dealing with the average attention span. The two fish swim up to a pole (like a barber pole) sticking out of the bottom of the ocean with PLP colours on it and the word “opinions” scrawled across it. Attached to it is an over-inflated balloon which reads: “PLP rulez”. To which the fish see it and suggest: “looks like the PLP are trying to float another overly inflated opinion poll”. Back in October I expressed disappointment at the poor statistical analysis of the decline in the ratio of Black executives in the workforce. Subsequently, I’ve done some digging and discovered that the Commission for Unity and Racial Equity produced the comprehensive, non-spin based, numbers I was looking for. 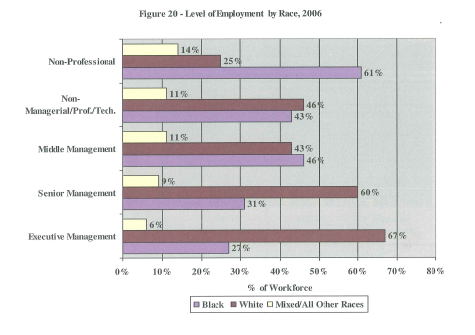 As part of the Annual Review of the Workforce Survey Report 2006, here is the depiction of the Level of Employment by race for 2006. As quoted by Community and Cultural Affairs Minister Wayne Perinchief, the rate of black executives indeed did decline from 29% in 2005 to 27% in 2006. In my piece, I questioned whether the hard actual number of black executives increased or decreased. Studying the actual numbers, the number of black executives overall decreased from 173 in 2005 to 159 in 2006. However, it is interesting to note that in 2004, the percentage of black executives was 27%, some 154, which suggests that if you compare 2004 to 2006, the percentage was the same and yet there was an increase of 5 black executives. Interesting. Lets dig a little bit further back as data was collected in 2003 and 2002 wasn’t it? Well, in 2003, the percentage of black executives in the workforce was 21%, however, the number of black executives was 203. In 2002? The percentage of black executives in the workforce was 22% with the overall number being at 217. So, we’ve had over the years a gradual decrease in the number of executives overall, black executives included, however, the percentage of black executives has been generally trending upwards indicating that despite the wild claims of some, international business may well be doing it’s part in promoting blacks in the workforce. Though, of course, all we really care to focus on is the one year drop from 29% to 27% in 2006 rather than focusing on the data that has been available for 5 years, right? Now, here’s the real kicker. While digging through the actual hard numbers I discovered that ‘black executives’ isn’t the same as ‘black Bermudian executives’ in CURE’s statistics. I’ve realised that I was making the incorrect assumption that CURE statistics was dedicated to promoting equality between Bermudians in the workforce. However, this was not the case as CURE was originally studying race overall including Bermudians and non-Bermudians in their reports. From 2004 on, statistics have been improved to give breakdowns of employment levels by race and Bermudian status, which presents a far different picture. This leads me to a whole new question, how are non-Bermudian’s being worked into the justification for why workforce equity legislation as it exists in it’s draft form is necessary and should they be non-Bermudians be included when calculating whether black Bermudians have fair representation in our workforce? More on this with greater investigation of the real hard numbers to come, as time allows. Phil Wells over at A Limey in Bermuda hits it dead on with his commentary regarding the PLP and it’s fear of criticism. Well, why should a political party’s website link to or publish comments from its critics, you may ask? Isn’t that expecting a bit much? Not if that party has any self-confidence, it shouldn’t be. A link isn’t an endorsement, it’s an acknowledgment of the existence of another point of view. It’s what blogging is all about: a debate between people with different opinions. You link to your intellectual opponents because you respect your readers’ right to make up their own minds, while remaining confident that your own arguments are the stronger ones. Thus far the PLP have proven themselves incapable of rationally debating any point which serves as a grave disappointment. Instead, they continually resort to demonizing every critic as if everyone who holds an opposing point of view must be evil, a racist or both. Acting as if having a different point of view is unhealthy and wrong when in reality it can help strengthen proposals. Unfortunately the PLP have failed to realize that for many bloggers it isn’t simply about targeting the PLP, it’s about coming up with solutions that will yield the best results for our island. We care about Bermuda, it’s why we blog. We care about ensuring we have the just and accountable government that we so much need and deserve, UBP or PLP. Despite people who attempt to attest to the contrary, the internet isn’t a fad and likely many of today’s blogger’s would still be critical of a UBP government if they won the coming election. Undoubtedly, if the UBP did win and PLP supporters chose to rise up and rationally criticize and debate issues, policy and proposed solutions of a UBP government they’d be welcomed by the blogging community. Healthy debate is essential and regardless of the government, PLP or UBP, our leadership had better get used to it because the people finally have a voice. Being that my ipod is broken, this morning I was flipping through the radio stations on my way to work and caught Thao Dill talking about the recently launched UBP cartoon. He suggested it is so bad that even he feels sorry for them, to which I’ve got to say I agree. He said he felt like writing them a better ad because he feels so bad for them and he got me thinking that I could do the same. Here’s the ad I’d make if I were the UBP, it’d be a take off of the “I’m a Mac and I’m a PC” ads from Apple to capture a bit of popular culture that many people are familiar with and offer a parody to poke fun at the structure of local campaigning by each party. PLP: Produce noisemaker, banners and flags from behind back. PLP: blow noisemaker in the ear of UBP as UBP attempts to talk, jump up and down, wave and attempt to distract the viewer from paying attention to the UBP supporter. UBP: “Real issues that impact the lives of Bermudians that need to be addressed like housing, crime, etc”. PLP: continues jumping up and down, distracting until he realizes UBP has stopped talking. PLP: Compose himself, face camera and put a contented smirk on face as if success has been achieved in distracting the audience while having no idea that UBP paused things. Government’s sudden interest in the Kyoto Protocol must be some sort of joke as they attempt to suddenly put on an environmentally friendly persona contradicting past actions. Certainly it has expressed zero interest in it from 1998 all the way up until when it came into force in 2005. “With all due respect to this administration and past administrations, no one has taken a lead on this. Governments have looked only as far ahead as the next election. That is a very short timescale.” said Wayne Perinchief, Minister for Community and Cultural Affairs. Sounds a lot to me like this government is still only looking as far ahead as the next election. A quick reminder to the writers of the Bermuda Sun to note that Bermuda’s power generation is diesel and gas-turbine generated, not coal fired, which is far worse. BELCO has previously said that it is investigating all possible alternative energy solutions but that at present only more coal-fired generators are suitable for the island. Should BELCO itself be looking to escape some of the heat with regards to the non-green nature of their diesel based power generation they could be exploring algae farm technology to recycle the carbon dioxide produced by their power plants. That and explore further alternative energy options. "It wasn’t me. It was the one-armed man"
Premier Brown has had so many people speaking on his behalf as of late it’s hard to tell who to believe when he shift’s blame by suggesting it wasn’t him or that those speaking for him were incorrect and weren’t speaking for him, even when it’s their job. In the recent PLP email that was sent around, Premier Brown’s name was signed at the bottom as leader of the party. The long knives of the opposition are out. Along with their willing accomplices in the media, they will do everything they can to put old power brokers back in charge. But, the truth is, the old UBP power elites no longer control Bermuda — the people are in charge. And, we, the people have an obligation to keep government working for you — not for the old elites. Sincerely, Ewart Brown, Party Leader. “The Premier didn’t sit at a computer and write it,” he said, adding that Dr. Brown had no comment to make on its contents. Sorry Premier Brown, few may expect you to have the time to write everything that is sent out, but most do expect you to have knowledge of what your name is being put to and will hold you accountable to what is said if it’s sent from organizations which you lead. Again, that also goes for comments made by your Press Secretary. His sole job is to represent you and thus should be kept up to date on your position on issues considering that his word is to be taken as your official remarks. Thus, when he speaks for you and you don’t immediately correct it, it is hard to accept later when you correct it via facebook rather than through the media. Certainly, how can we now be certain that it’s actually you on facebook and you now won’t again turn around and claim that it again was someone else speaking wrongly on your behalf? This whole debacle is getting to the point where one could wonder if the Premier is attempting to pull an Abbot and Costello style “who’s on first” gag on our people. Finally, the sheer fact that our Premier has taken to using up handicapped parking spaces for his personal leisure begs the question of whether we’re about to hear him make like Jim Carrey as ‘The Mask’ and blame it on the one armed man. It was Mahatma Gandhi who once said “An eye for an eye makes the whole world blind”. I believe he was right. The only thing more startling than today’s news that the government has bid to get into the cement business was comments raised by a friend of mine regarding the offer. When speaking of the cement crisis and the buyout bid, my friend suggested that it was the right thing to be done in the interests of our island. By his suggestion, the Bermuda Cement Company has for years held a monopoly on cement supply to our island at the detriment of our people. Whenever trouble occurred in the negotiations between our government and the cement company, it is suggested that the cement company would disrupt supply as a tactic to gain leverage, thus disrupting construction across the island and holding government at bay. Thus, by his suggestion, the recent move on the part of the government has little to do with a dispute about relocating the facilities as it does an attempt to take over the business and hand it to new owners. The reasoning suggested as being that that privileged white people have owned and monopolized it for 40 years and thus it is time for a change in ownership, one that will hopefully bring fair prices and better supply to the people, especially if it is government owned. It is this line of suggestive reasoning that really has me stumped. Somehow the argument of past transgressions by the “rich white elite” has once again risen as justification for why unethical things should continue to occur today. That’s right, unethical. If it was wrong to do it then, how are things any better to perpetuate a similar injustice today. It are these thoughts which remind me of the words of Gandhi. So I asked my friend if this is the real intention of our government and if he truly believes is in the best interests of our people, than why be dishonest about it? Why dance around the truth by making the dispute about the land and the requirement of relocating the facility when it’s really about government harboring the desire to confiscate a business for the apparent betterment of the people. Doesn’t that scream dishonesty and a lack of proper ethics displayed by a government? To which my friend replied that the company displayed a lack of ethics with regards to suggesting that it isn’t financially feasible to relocate the business on the basis that they make money with ease. It was at this point that I realized that this was not a discussion that could be won on the basis of the arguments I was attempting to make. Honestly, I don’t accept the logic of an eye for an eye. Very simply, I fail to see how it could be justified that a government could even consider being deceitful, manipulative and unethical enough to conjure up a fake relocation requirement under the intentions of forcing a change in ownership of a business. I don’t mark what was done in the past as right and thus I don’t accept present wrongdoings as acceptable either. Furthermore, if such a change in ownership is truly believed by our leadership to be in the best interests of our island than why not be forthright about it? If you believe it’s right, why not have the testicular fortitude to stand behind your opinion and not hide behind shady tactics? The biggest thing that really gets me about all this and leaves me entirely skeptical about the entire process is that if our leadership truly felt that this company was abusing it’s monopoly could it not have simply moved to introduce reasonable artificial controls on the price of concrete? Then if the cement company refuses there would be reasonable grounds to request that they sell the outfit to someone else without this whole land dispute debacle. Unfortunately, who really knows what the real motivations behind this whole thing are. Should the PLP win the election, those who wonder the truth should watch with a keen eye to see if the facility is relocated as was demanded by the West End Development Corp. Should they not, then perhaps we will never know. One thing is for certain, I grow increasingly weary of local politics and the eye for an eye mentality we so desperately hold on to. It has come to a point where I have found myself questioning whether it is something I really wish to have any involvement with and whether this island is really a place where I wish to continue to reside. While I have yet to find answers to these questions, they are ones that do not pass without a great deal of contemplation.